Reborn is the wordpress theme, base on wordpress default 1.6 and part of icons is from silk`s icon. Supports 800 x 600 or higher is compatible with adaptive characteristics. 4.Popularity Contest (not necessary) and etc. 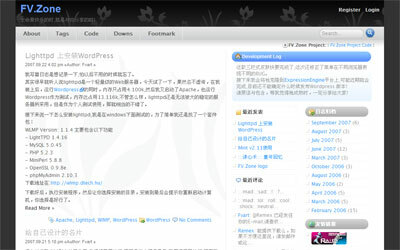 This entry was posted on 星期四, 九月 27th, 2007 at 16:19	and is filed under WordPress. You can follow any responses to this entry through the RSS 2.0 feed. You can leave a response, or trackback from your own site. Powered by WordPress | 56 Queries. 0.246 seconds.